or send orders via e-mail. Title: Penny Pinwheels - New in 2015! This quick tablerunner can be made with leftovers from a jelly roll or just scraps from your stash. The length can easily be changed by increasing or decreasing the number of pinwheels. It's perfect for that narrow table or shelf. Title: Broken - New in 2015! This easy project could be used as a topper or small wallhanging. Although it is charm pack friendly, it could easily be made from the scraps in your stash. By adding more blocks it could be made into a runner. Make it suitabe for any season or holiday simply by changing the fabrics. Title: Sash-a-Stash - New in 2015! This is a quick, easy project that would be great for a beginner. The size can easily be adjusted by cutting the strips narrower or wider. This project is also charm pack friendly or can be made with leftovers from a jellyroll. Title: Coin Collection - New in 2015! Size: 17 1/2" X 34" AND 20" X 39" placemat pattern also included. Traditionally called Chinese Coins, the narrow strips go together quickly. This pattern will work with any line of fabrics or any season of fabrics making it a very versatile pattern that can be used over and over. This would be a great beginner project or a quick project for a veteran quilter. Title: 3 Sisters - New in 2014! Size: 18 1/2" X 34"
This pattern utilizes an easy strip-piecing technique that makes the stars a breeze to sew. Even the center goes together quickly making this project suitable for even a confident beginner. Size: Approximately 29" X 29"
Sewing strip sets makes this a quicker project than you might think. A good assortment of scraps really gives it a vintage feel or it can be made with a background and two fabrics which could make it suitable for any season or holiday. Size: Approximately 28" X 28"
This quick, easy project is a great way to use up small scraps and old uglies, and is easy enough for a confident beginner. Colors could be selected to make it appropriate for any season. 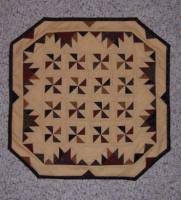 Size: Approximately 19" X 29"
One of the easiest patterns that can be made with half-square triangles is Broken Dishes. Using a good assortment of scraps really gives it a vintage feel. Size: Approximately 18" X 32"
CHARM PACK FRIENDLY! This would be a great beginner's project. It can easily be made longer just by adding a few rows of either the center section or the end sections. Buttons and rick rack add a great third dimension to the project. This even works with seasonal charm packs. This can be used as a tabletopper or small wallhanging. An easy machine applique technique is used for the petals in the center. Rick rack has been sewn at the edge of the binding for an extra accent of color. 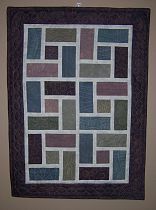 This is a quick, easy applique project (even the quilt blocks) that will look great hanging in your entryway or foyer. Use Heat 'N Bond Lite if you want to stitch around all the edges or Heat 'N Bond Ultrahold for a no-sew applique technique. Any ONE of these projects can be made with a charm pack and half a yard of background fabric, or just by using your own scraps. Instructions are included for all three. This pattern is much easier than it looks. Only two different blocks, two sizes of squares, and one rectangle shape are used to create the entire top. The appliques are applied using the raw edge applique technique making this a quick, easy project. This is a quick, simple project with basic quilt construction and would be easy enough for even a beginner. This tablerunner can be made suitable for any holiday or season by selecting appropriate fabric colors. Template pattern is included for the Dresden sections. Quick, easy machine applique, basic piecing, and prairie points make this a simple little wall quilt. This topper is as easy as it looks. All the pieces are cut from a single triangle template. It can easily be resized by either cutting the triangles a different size or by adding or deleting rows. Pattern for template is included in the pattern. This topper is a quick, easy project that can be made suitable for any season or holiday. The scrappier the better is my motto, but could easily be made with just three fabrics in the center. Five different seasonal appliques are included. 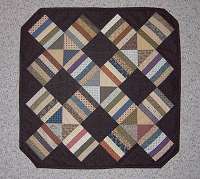 Size: 20" X 29 1/2"
Select a smashing color and outside border and the blocks can be made from your scraps. 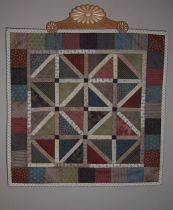 Blocks can be made scrappy or with just two fabrics. Idea: Use bright Halloween prints for the blocks, black sashing, and an orange or lime green print for the borders. It can easily be made suitable for any season. This pattern is a tribute to my Aunt Edie who first planted the seed of creativity in me by the great hand-made Christmas gifts she made for all the nieces for Christmas. This is a quick, easy project that can be made suitable for any holiday or season. 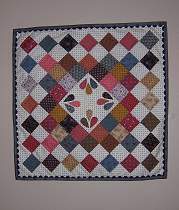 This wall quilt is comprised of some of the different things you can do with half-square triangle blocks. With the use of Thangles or Triangulations, this is a much easier project than it looks. It is made completely with just one size of half-square triangles. This quick, easy project can be used as a topper or a wall quilt. It's a great way to use up some of those odds and ends of scraps. Use decorative stitches on your sewing machine and the enclosed template to make this an easy weekend project. Most of this project can be made from your stash. Use 30s fabrics to make it look springy, Kansas Troubles to give it the feel of autumn, or reds and greens for a holiday flair. Size: 15" X 34 1/2"
This tablerunner can easily be made suitable for any season or holiday simply by choosing the appropriate color of fabrics. It can also be made longer by adding more of the center rows. Although designed as a tablerunner, it would resemble a stained glass window if hung on the wall. It is jelly roll or charm pack friendly and can easily be made wider or longer. 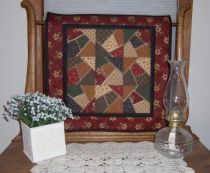 Size: 20 1/2" X 20 1/2"
This little quilt can be used as a tabletopper or wallhanging. If you have never used Thangles this would be the perfect project to try them. The little half-square triangles come out so perfect without all the time consuming trimming. Size: 14 1/2" X 35"
Flying geese units make this a quick, simple project. It can take on the feel of any season simply by changing the fabrics you choose. Additional seasonal applique designs are included as well as instructions for matching placemats. Although pictured in shirtings and Civil War fabrics for an antique look, this pattern would also work in 30's fabrics for a nice, springy wallhanging or Kansas Troubles for fall. 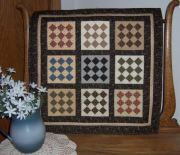 The simplicity of this little wall quilt makes it a real charmer! 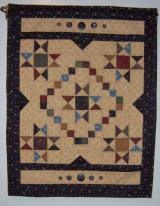 Size: 21" X 27 1/2"
For all you quilters who love stars, this is the project for you. It can be used as a wallhanging or a table runner. Prairie points and buttons give this one some extra pizzaz. Size: 9 1/2 X 10 X 4" and 8 X 9 X 3 1/2"
The picture doesn't do these bags justice. Both sizes have a large outside pocket and a cell phone pocket on the end. Several pockets on the inside help keep all the contents organized. Either bag can be made in a one-day workshop if the sewers come with the fabric already quilted. Ties gather up the ends for a cute decorative accent. Bags have a magnetic snap closure. 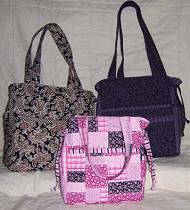 This is another pattern that can be made from your scrap bag or with just two colors. Open areas lend themselves to feature decorative quilting. It is a great pattern for using your Triangulations Program. More designs . . .